News Report (translated from K2Kapital.com): “The word ‘Socialism’ is no longer looked down on in the USA” The crisis on Wall Street, loss of savings and pension funds, the real estate market collapse and unemployment have raised the issue of economic survival. The crisis calls for an increase of government regulation and a rejection of liberal methods in the financial sector. The word “socialism,” terrifying to the American ear just a short time ago, no longer seems so scary. What’s so bad about socialism, anyway? Let the government care for its citizens instead of protecting the interests of billionaires. My Comment: For the time being, the aspiration toward socialism is selfish and egoistic, but it cannot be otherwise. People are gradually starting to realize that globalization is the new reality in which we need to live, that the world is like a small village, like one family. This concept is readily talked about, but not yet fully grasped. We haven’t yet accepted it as a fact, as a phenomenon that has suddenly manifested in our world, which we cannot escape, and which obliges us to completely change our lives. It is similar to the feeling of a person who has been sentenced to life imprisonment: he gradually realizes that his life now has to undergo a major change, and how such a change requires him to adopt an attitude and behavior different from before. Through theoretical recognition and the study of Kabbalah. 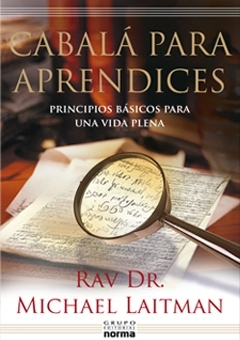 The largest publishing house in Latin America, “Norma Editorial Group,” reports that the book Cabalá para Aprendices (a translation of the English book Kabbalah Revealed) is a bestseller at the international book expo in Santiago, Chile. All 2000 copies that were in stock were sold out on the first day of the expo. An additional edition is urgently being printed for Chile and for the expo’s continuation in Argentina and other Latin American countries. Question: What’s more important in a musical composition, wisdom or spirituality? Question: Is listening to music a waste of time? My Answer: Not if it helps you keep an intention aimed at the goal. Question: I once heard the following expression: The rhythm of music makes the Earth go round! Question: According to nature, what percentage of humanity will consciously feel the question about the meaning of life so strong that they will be able to study Kabbalah? My Answer: There’s no specific percentage – it will be anyone with a point in the heart. Question: What do you think of false teachings that unconsciously use elements of teachings that were effective in the past? Question: I’m asking because it is these kind of teachings that are leading in the “spiritual market.” What’s their purpose? My Answer: For us to learn from our mistakes. Question: How do you view euthanasia? Laitman.com Post: What Is Death? How Can We Not Fear Death?